The Great Race » Here We Go AGAIN! Well, we leave for Buffalo day after tomorrow. And we’ll be bringing Great Race to my city, Troy, NY on our second night out (June 24). ExCITEment! It worked last year -this time for sure! 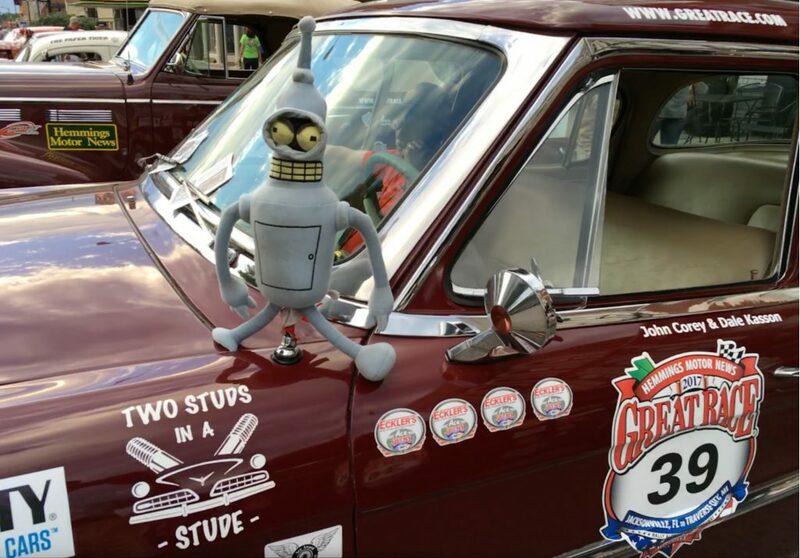 Our 54 Studebaker Commander Landcruiser (known as ‘Bender’ for short) is probably ready. It’s been a a little cranky about starting after it sits a bit, but otherwise runs great. Since last year, when the clutch linkage fell out (OK, admittedly after I slid it into a fence when I missed a not-really-paved corner…), we’ve done a lot, with attention to detail (including some – ahem – new paint on one side…). We rebuilt the carb, put in all new engine mounts, replaced the sticky throttle linkage, readjusted the clutch linkage, fixed a minor fluid leak in the brakes’ hill-holder device, checked or changed all the fluids & filters, and tightened a myriad of loose screws, including some on the front control arms (YIKES!). And we got smart and moved the 6-to-12 DC-DC converter for the TIMEWISE rally speedo onto a switched circuit so it won’t run the battery down at night. With all this preparation and cleverness, how can we go wrong? We also practiced a bit: starts, stops, and turn losses. I had hoped to improve the shift linkage (3 on the tree), which is a wee bit sloppy, but no time for that, so I just have to be careful on that 1-2 shift and not try to beat the synchros. I think we’ve packed a spare for every part we could ever need (except the one that will actually break), and there are bottles of all known automotive juices, too. Fortunately, the trunk is capacious, so we can still squeeze in a bag or two of clothes. Look out, everybody, here comes Bender, #39, carrying Two Studs in a Stude! I love bender, see you thursday. Love those “self loosening screws!” See you in Buffalo! I wish you the best luck ever ? My first year with this as a spectator. Looking forward to it and enjoy reading all about it here!! “Start your engines”! Thank you for sharing your and Bender’s adventure as you journey to Nova Scotia. It has been interesting and enjoyable following yours and the other racers/navigators progress as you reach your destination. I wish you all good luck and Godspeed.